Templemore in mid-February: Contrast the pouring rain, penetrating damp and gloomy overcast sky with the bright, happy and animated faces of riding club members and you begin to understand the enduring attraction of the North West League. Despite the awful weather conditions, it was a real pleasure to be at the opening leg of the competition. Attendance was high, boosted by the welcome presence of three riders from the Rosann riding club and a host of competitors from the Inishowen branch. It will take a while to get to know all the new faces — sometimes recognising the new horses is easier! We also welcomed our own new member, Ewelina, who attended on foot and helped out on the day. We were missing some familiar 4-legged members of our own club, with Molly on the sick list and Fenway tucked up at home watching the rugby while he nursed his man flu. Jenny isn’t 100% sound and also missed her 2013 debut while Sapphire travelled to the show before Hazel wisely scratched her from the competition after an uncharacteristically below-par performance in her training round. Hopefully all these patients will be back in action very soon. As always, the North West League is a wonderful schooling ground for horse and rider and there were several novice partnerships dipping their feet in the water for the first time. Rachel was delighted with the performance of her two youngsters, Bella (Hurricane Midge) and Bambi (Newmills Aristocrat). Nadine and Armstrong were also out for a learning experience and got to know each other better at a slightly higher grade. Meanwhile, Family Hamilton tried out Lenamore San Jose, a prospective purchase from Geraldine Graham’s yard. Both Enda and Marina enjoyed some training rounds on him while Jade and Kelly gave him the thumbs up as a new family member. But in terms of competition, it was the old guard who picked up top points at every level. Remarkably, with Hazel unable to compete, Liz Potter was the sole competitor at primary level and duly took top place. Laurence Smyth on Jenny’s Jigsaw kept things going for the Gaeltachts with a great win at Advanced Primary. By the time the Intermediates came around, the competition was really hotting up. Seven riders made it through to a thrilling jump off with Leo, Paddy, Francis and Anne all giving their best for Letterkenny. Paddy put in a great performance on Lizzie until the map-reading skills failed them at the last fence and the dreaded elimination bell sounded. With Carmel Ferry in the lead and Rosaleen Harkin in second place, our club’s honour rested on Anne’s shoulders as she and Molly entered the arena as the final competitors. They duly delivered and chalked up a great victory for Letterkenny. Despite the increased number of competitors in the Advanced Intermediate class, clear rounds were thin on the ground. It was Damien who pulled off a fine win in the jump off and set himself up nicely for a tilt at the overall league title. Full results and league standings will follow in due course. 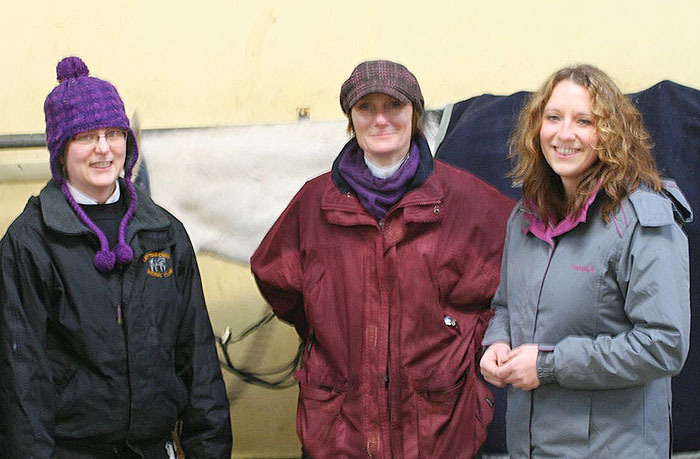 Pictured below: New member Ewelina Wyszynska (right) getting to know the riding club scene with Sharon and Hazel. This entry was posted in North West League, Show Jumping, The Horses, The People. Bookmark the permalink.